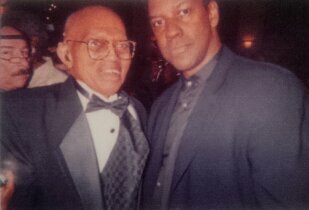 Professor Arthur Tolson, Ph.D., along with Denzel Washington who portrayed his father Melvin Tolson in The Great Debaters. Arthur L. Tolson, Ph.D, a longtime faculty member in the Southern University Baton Rouge Department of History, died Wednesday, November 18, 2015, in Baton Rouge. He was 91. SU System President-Chancellor Ray L. Belton issues the following statement and condolences: “The Southern University System is tremendously saddened by the passing of former history professor Dr. Arthur Tolson who served as a faculty member in the Department of History at Southern University for 45 years. A true scholar and intellectual, Dr. Tolson touched the lives of countless students and was a trusted mentor to many of his colleagues and fellow SU faculty members. His legacy of teaching and commitment remains an exemplary model for others. We extend our deepest sympathy to Dr. Tolson’s family and friends. Tolson made history as the first Black to attain a master’s degree in history from Oklahoma State University and a doctorate in history from the University of Oklahoma. Share your memories of Dr. Tolson below along with photos for his commemorative page. Dr. Tolson was my history professor at Southern University in 1985. He had a unique sense of humor and knew how to keep our attention in class. He shared my philosophies of life with us, many that made you really think. He was my favorite professor as well as the one I will always cherish knowing. One of the great philosophies Dr. Tolson shared with his students was how to study successfully. He told us we had to “read and re-read” each chapter three times. This technique would afford us the opportunity to pass his test. He also had a unique procedure for test taking. He would provide the paper for us to use. Dr. Tolson knew some students would have documents that would assist with the test (cheat sheet). So, we used his papers which were test taken by students 10-15 years earlier. We were to write our answers on the back of the previously used papers. It was so funny to see the look on my classmates faces as they realized their plan had been sabotaged. You will truly be missed Dr. Tolson. Thanks for the words of encouragement over the years. I am honored to have known you!